to study maps and charts. and make his father glad. 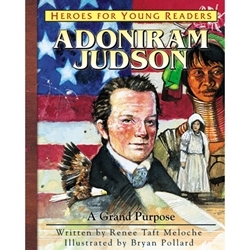 When Adoniram Judson (1788-1850) discovered for himself that God's love is real and His Word is true, he and his wife, Ann, risked everything to share God's great love with the people of Burma (Myanmar), becoming America's first foreign missionaries. In the midst of war, Adoniram translated the Bible into the Burmese language so that others could discover God's truth as he had.